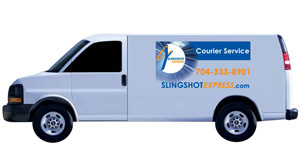 Slingshot Express Courier Service, LLC, was formed to serve the greater Charlotte area with superior same day logistics services, because we understand that a company’s resources are maximized when they are focused on core company business. Slingshot Express’s core service offerings were designed to ensure that your products arrive same day, most often in four hours of your call, and with the least amount of product handling—the quickest and most effective way to satisfy your customers. Our mission is to provide you with superior delivery services that surpass your expectations, daily, with friendly drivers using the latest in mobile technologies. Our "Dispatch" software is the leading logistics software on the market. From tracing, mapping, communications and more, Dispatch allows Slingshot Express to ensure that you and your customers will receive superior service every day. And, as the needs of our customers grow and evolve, so does our Dispatch software—continually upgraded to meet your needs. When it comes to the latest in service and technology, Slingshot Express is a leader in product delivery. Our management, dispatchers, drivers and sales staff, together as a team, put the greatest emphasis on safety, as well as friendly and reliable delivery of your product. Slingshot’s staff training program is provided to everyone from management to drivers and designed to satisfy both you and your customers and suppliers.